Albert Einstein is considered one of the greatest geniuses of the twentieth century. On March 14, 1879, he was born in Württemberg, Germany to Jewish parents. Einstein developed an early interest for mechanics and for mathematics, due in part to Max Talmund, a poor mathematics student who was invited to dine with the Einstein family. Talmund encouraged a ten-year old Albert to read books in science, sparking his interest in this field. After the failure of his father’s business, the Einstein family moved to Switzerland. In 1896, Einstein entered the Swiss Federal Polytechnic School in Zurich, where he would receive a diploma in teaching physics and mathematics. While attending school, Einstein would meet his future wife, Mileva Mari?. A remarkable woman whom Einstein referred to as his “equal”, Mari? was the only female enrolled in the Polytechnic School, and was one of the first women in Europe to formally study mathematics and physics. As Einstein was unable to find a teaching post after graduating in 1901, he secured a job at the Federal Office for Intellectual property as an assistant examiner. His responsibility at the patent office was to examine applications for electromagnetic instruments. Einstein’s experiences in this office sparked interest in the investigation of electric signals, which would form the basis of some of his later experiments. 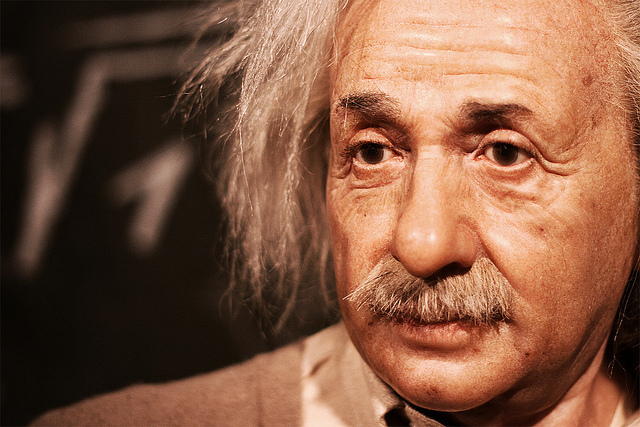 Einstein later left his job at the patent office, and was appointed to several teaching positions. He became Professor extraordinary at Zurich in 1909, and in 1911 was made Professor of Theoretical physics in Prague. Three years afterwards, he was made a Professor in the University of Berlin. During this time, Einstein’s marriage would become strained, and in 1919 he and Mari? would divorce after having three children. Later that year, Einstein married Elsa Löwenthal, his first cousin. In 1933, just six years before the start of the Second World War, Einstein renounced his German citizenship and migrated to the United States. He took up the post of Professor of Theoretical Physics at Princeton University. Throughout Einstein’s career, he was praised for his persistence in finding ways to solve problems in physics. Einstein’s legacy lives on through the numerous books and articles he published throughout his life, as well as in the contributions he has made to the field of science. The theory of relativity, which sought to explain the nature of space and time, was first introduced in “On the Electrodynamics of Moving Bodies,” a paper written by Einstein in 1905. Einstein’s assertion that a great amount of energy could be released if matter was converted to energy, represented by the famous equation, E=mc2, formed the basis for the eventual creation of the atom bomb. After receiving several awards for his discoveries, including the Nobel Prize in Physics in 1921, Einstein died on April 18, 1955.